How does automatic reweighting of the Promoting Interoperability (formerly ACI) performance category apply to groups? MIPS clinicians who are part of a group practice and have assigned their billing rights to the group’s TIN will be assessed as part of the group, and will not have their Advancing Care Information score reweighted to zero. Do I have to register to report MIPS as a group ? A practice does not have to register directly with CMS to report as a group. This option is open to all practices with 2 or more providers billing within the same TIN. If you have previously reported as individuals and will be reporting as a group in 2018, we ask that you contact us at support@mdinteractive.com to let us know so that we can modify your account. Note that if you are reporting one component of MIPS as a group, you will be evaluated as a group for all of the components. What is included in the data submission to CMS? MDinteractive provides CMS with the reporting and performance rate calculations for the measures submitted by a provider (using the combination of the individual NPI/TIN as the identifier). Individual patient information is not submitted to CMS. Most quality measures can be used for 90-day performance period. There are some measures, though, that by design, are hard to align with a 90-day performance period and some are not feasible for certain timeframes in which the measure may be analyzed. For example, some measures are based on observation periods after an event such as a surgery or discharge from acute care. MIPS Quality ID: 191, CMS133: Cataracts: 20/40 or Better Visual Acuity within 90 Days Following Cataract Surgery, has a 90-day look forward period of observation after the denominator qualifying event of cataract surgery. This is accommodated in the measure specification by including only cataract surgeries in the first 270 days of the year (January 1 through September 30) allowing for follow-up assessment within 90- days post-surgery (October 1 through December 31) before the end of the calendar year. Therefore, a 90-day performance period that included dates in October, November, or December would not be feasible for submission purposes and an alternative to the 4th quarter 90-day submission period should be selected for this measure. There are 43 quality measures that may not be ideal if implemented within the 90-day performance period; the limitations and rationale associated with these measures are indicated in the table, located in the appendix of this CMS document. What are the MIPS validation criteria? The Quality Payment Program Final Rule with comment requires CMS to provide the criteria it will use to audit and validate measures and activities for the 2017 transition year of MIPS for the Quality, Advancing Care Information, and Improvement Activities performance categories. By definition, data validation is the process of ensuring that a program operates on accurate and useful data. MIPS requires all-payer data for all data submission mechanisms with the exception of claims and the CMS Web Interface. The data from payers other than Medicare will be used for informational purposes to improve future validation efforts and will not be the only source of data used to make final determinations on whether you pass or fail an audit from the 2017 transition year. Under MIPS, CMS will conduct an annual data validation and audit process. In accordance with the False Claims Act, you should keep documentation up to 6 years and, as finalized in the 2018 MIPS Year 2 final rule, CMS may request any records or data retained for the purposes of MIPS for up to 6 years. The Quality performance category within MIPS assesses health process and outcomes through quality measures. MIPS eligible clinicians should demonstrate quality performance assessed against a performance benchmark. The performance benchmark is based on historical or performance period data (or potentially based on 2017 performance data for quality measures with no historic benchmark). 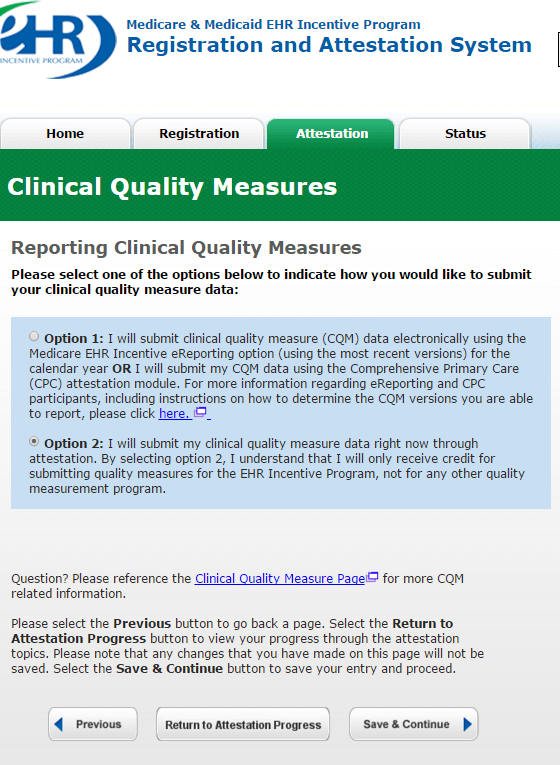 For the 2017 transition year, CMS’ data validation process for the Quality performance category will apply for claims, EHR, and registry submissions to validate whether you submitted all applicable measures and encounters when submitting fewer than six measures or when you do not submit the required outcome measure or other high priority measure, or submit less than the full set of measures in the applicable specialty set. The MIPS Advancing Care Information performance category replaces the Medicare EHR Incentive Program for eligible professionals, also known as Meaningful Use. The MIPS Advancing Care Information performance category promotes patient engagement and the electronic exchange of information using certified EHR technology. Under this performance category, eligible clinicians will have greater flexibility in choosing measures to report. You should retain documentation to support submissions for the Advancing Care Information performance category. Under this performance category, you’ll be able to choose from many activities to show your performance. This performance category also includes incentives to help you participate in certified patient-centered medical homes and APMs. Your documentation used to validate your activities should demonstrate consistent and meaningful engagement within the period for which you attested. What are the 2017 Medicare Shared Savings Program and MIPS Interactions? What is the Promoting Interoperability (formerly ACI) Prevention of Information Blocking Attestation? Do I Have to Attest? If you are a MIPS eligible clinician who reports on the advancing care information performance category you must attest to the prevention of information blocking attestation. If you are reporting as a group, the prevention of information blocking attestation by the group applies to all MIPS eligible clinicians within the group. Therefore, if one MIPS eligible clinician in the group fails to meet the requirements of the Prevention of Information Blocking Attestation, then the whole group would fail to meet the requirement. If you want to earn a score for the advancing care information performance category, you have to act in good faith when you implement and use your CEHRT to exchange electronic health information. This includes working with technology developers and others who build CEHRT to make sure the technology is used correctly and is connected (and enabled) to meet applicable standards and laws. You must also ensure that your organizational policies and workflows are enabled and do not restrict the CEHRT’s functionality in any way. For example, if your CEHRT gives patients access to their electronic health information or exchanges information with other MIPS eligible clinicians, your practice must use these capabilities. A MIPS eligible clinician must attest that they did not knowingly and willfully take action (such as to disable functionality) to limit or restrict the compatibility or interoperability of CEHRT. Statement 1 requires MIPS eligible clinicians to demonstrate that they did not knowingly and willfully take action to limit or restrict the compatibility or interoperability of CEHRT. Implemented in a manner that allowed for the timely, secure, and trusted bidirectional exchange of structured electronic health information with other health care providers (as defined by 42 U.S.C. 300jj(3)), including unaffiliated providers, and with disparate CEHRT and health IT vendors. A MIPS eligible clinician must attest that they responded in good faith and in a timely manner to requests to retrieve or exchange electronic health information, including from patients, health care providers (as defined by 42 U.S.C. 300jj(3)), and other persons, regardless of the requestor’s affiliation or technology vendor. Do I Have to Show Any Documentation to Attest? Implement and use your CEHRT to support the appropriate exchange of electronic health information. What are the Improvement Activities Eligible for PI (formerly ACI) Bonus Score? Any suggestions regarding Improvement Activities documentation? What are benchmarks and how do they apply to Quality scoring? For quality measures, CMS uses data that was reported in previous years to create performance benchmarks. Each quality measure is converted into a 10 point scoring system. Performance on quality measures is broken down into 10 "deciles", with each decile having a value of between 1 and 10 points. A clinician or group's performance on a quality measure will be compared to the performance levels in the national deciles. Registry measures are compared to registry benchmarks. Note: If a measure cannot be scored against a benchmark or no benchmark exists, it will automatically receive 3 points as long as it is complete. How will CMS determine if I could have reported more measures (i.e. EMA)? Eligibile clinicians submitting via claims or a qualified registry who submit less than 6 measures or no outcome or high priority measure will be subject to EMA (Eligibility Measure Applicability) process to determine if additional clinically related measures could have been submitted. If CMS determines that there are no applicable measures for the clinician, they won't be held accountable for not submitting those measures. If CMS discovers that additional clinically related measures could have been submitted and were not, it will impact the Quality performance category final score. Specific to the submission mechanism. For example, EMA will not determine that a registry submitter had a claims measure available. What do the different classifications of Quality Measures mean (Outcome, High Priority, Process)? Process Measures - Process measures show what doctors and other clinicians do to maintain or improve health, either for healthy people or those diagnosed with a given condition or disease. These measures usually reflect generally accepted recommendations for clinical practice. Process measures can tell consumers about medical care they should receive for a given condition or disease, and can help improve health outcomes. Outcome Measures - Outcome measures show how a health care service or intervention influences the health status of patients. Examples: The % of patients who died becauses of surgery or the rate of surgical complications or hospital acquired infections. Outcome measures are the result of many factors, some of which may be out of a clinician's control. An Outcome Measure is also classified as High Priority. CMS asks for an Outcome Measure to be reported as part of the 6 total measures (if one is applicable). High priority Measures - High priority measures include the following categories of measures: Outcome, Appropriate Use, Patient Experience, Patient Safety, Efficiency measures, Care coordination. As a clinician in a Shared Savings Program ACO, what are my reporting requirements? Quality Performance Category: Your ACO is required by the Shared Savings Program to report quality measures through the CMS Web Interface. The quality data reported to the CMS Web Interface by the ACO will be used to score the MIPS Quality performance category and the score will apply to each MIPS clinician in the ACO. Improvement Activities and Cost Categories: As a MIPS clinician in the Shared Savings Program ACO you won’t need to report any data for the MIPS Improvement Activities performance category because you will automatically receive full points for this category. In addition, MIPS clinicians in a Shared Savings Program ACO will not be assessed on the MIPS Cost performance category. Promoting Interoperability (formerly ACI) Category: All ACO participant TINs in a Shared Savings Program ACO, including ACO participant TINs that are in a Track 2 or 3 ACO, are responsible for submitting data for the Promoting Interoperability performance category apart from the ACO as specified by MIPS. This information is necessary for the Shared Savings Program to measure the level of CEHRT use among clinicians participating in the ACO. APM Scoring Standard: The Shared Savings Program is a MIPS APM, and all MIPS clinicians in Shared Savings Program ACOs will receive special scoring for MIPS under the APM scoring standard. Consequently, all MIPS clinicians in your ACO will receive the same MIPS final score. What if my ACO does not successfully report quality measures through the CMS Web Interface? While unlikely, since most ACOs successfully report quality measures through the CMS Web Interface, if you believe your ACO won’t report what it needs to under the Shared Savings Program, your ACO 4 Quality Payment Program Fact Sheet participant TIN can submit quality data for the performance year under any of the MIPS standard reporting options. If the ACO doesn’t meet its reporting requirements, we’ll look for and use any quality data for the performance year that your ACO participant TIN sent in apart from the ACO to score your quality domain under MIPS. Your ACO participant TIN will still receive full points for the MIPS Improvement Activity performance category and it will not be assessed on the MIPS Cost performance category. Your ACO participant TIN will still need to report for the Advancing Care Information category according to the MIPS requirements for this category. Instead of being scored at the ACO level, the MIPS clinicians under each ACO participant TIN will receive their own MIPS final score. How would I get a PI (formerly ACI) Hardship Exception? A group’s Promoting Interoperability performance category score is automatically reweighted, (or exempted in the case of groups participating in a MIPS Alternative Payment Model (APM)), and the group would not need to submit a Quality Payment Program Promoting Interoperability Hardship Exception Application if all of their MIPS-eligible clinicians within the group receive a hardship exception or fall into one or more of the Special Status categories above, with the exception of a non-patient facing group which only requires that 75 percent of clinicians are non-patient facing. In addition, a group is automatically reweighted (or exempted) and does not need to submit a Quality Payment Program Hardship Exception Application if it is non-patient facing. Groups are considered non-patient facing if more than 75 percent of its clinicians have 100 or fewer patient-facing encounters (including Medicare telehealth services). If all of the MIPS-eligible clinicians within a group do not qualify for an automatic reweighting or do not submit an application for and receive a hardship exception, the group will not qualify for an automatic reweighting and will have to report on the Promoting Interoperability performance category. How can I find Improvement Activities that are most relevant to my practice? 1. Achieving Health Equity: Engagement of new Medicaid patients and follow-up. 2. Behavioral and Mental Health: Activities that look at the co-morbidity of mental health and physical health. Some cross-over with Quality measures. 3. Beneficiary Engagement: Engagement of patients through post-visit surveys, tracking reported outcomes, using care plans to manage chronic conditions. 4. Care Coordination: Coordination of care between clinicians. Health information exchange, coordinated planning, etc. 5. Emergency Response & Preparedness: Supporting communities by registering to be part of a disaster relief team or participation in supporting humanitarian needs. 6. Expanded Practice Access: How accessible you are to your beneficiaries? 7. Patient Safety and Practice Assessment Population Management: Patient safety monitoring programs (i.e. prescriptions drug monitoring, appropriate use of antibiotics, etc. 8. Population Management: Population health. Using research, tools, etc. Note: Many of the medical society sites have posted suggestions for their specialties for the IA category. Do Clinicians Practicing in Rural Health Clinics (RHCs) or Federally Qualified Health Centers (FQHCs) have to participate in MIPS? Clinicians practicing in RHCs or FQHCs who provide services that are billed exclusively under the RHC or FQHC payment methodologies are not required to participate in MIPS (they may voluntarily report on measures and activities under MIPS) and are not subject to a payment adjustment. However, if these clinicians provide other services and bill for those services under the Physician Fee Schedule (PFS), they would be required to participate in MIPS and such other services would be subject to a payment adjustment. Do Clinicians Practicing in Critical Access Hospitals have to participate in MIPS? Clinicians included in MIPS and practicing in CAHs are required to participate in MIPS unless they are exempt. For MIPS clinicians practicing in Method I CAHs, the MIPS payment adjustment would apply to payments made for items and services that are Medicare Part B allowed charges billed by the MIPS clinicians. The payment adjustment would not apply to the facility payment to the CAH itself. For MIPS clinicians practicing in Method II CAHs who have assigned their billing rights to the CAH, CMS would apply the MIPS payment adjustment to the Method II CAH payments. For MIPS clinicians practicing in Method II CAHs that have not assigned their billing rights to the CAH, the MIPS payment adjustment would apply in the same way as for MIPS clinicians who bill for items and services in Method I CAHs. How does being part of an APM impact the Promoting Interoperability (formerly ACI) category of MIPS? All MIPS clinicians will report data for the Promoting Interoperability performance category as usual according to the general MIPS requirements. MIPS clinicians can report their Promoting Interoperability data via attestation and the CMS Web Interface (only available for groups of 25 or more), which you can access via qpp.cms.gov, as well as through a QCDR, Qualified Registry like MDinteractive, or Certified EHR technology (CEHRT). All Medicare Shared Savings Program ACO participant Tax Identification Number’s (TINs) must report the MIPS Promoting Interoperabiliyy performance category regardless of whether they meet the QP thresholds or not. The Medicare Shared Savings Program ACO participant TIN scores for this performance category will becombined as a weighted average based on how many MIPS clinicians are in each TIN. This will result in one ACO group score for the Advancing Care Information performance category that applies to all MIPS clinicians in the ACO. For the Next Generation ACO model and all other MIPS APMs under the APM scoring standard, MIPS clinicians in the APM report on the Promoting Interoperability performance category through either a group TIN or individual reporting. We’ll score each MIPS clinician in the APM using the highest score for the TIN/NPI combination for each MIPS clinician, which may be from individual or group reporting. The score given to each MIPS clinician will be averaged with the scores of the other clinicians in the APM Entity group to produce one APM entity score for the Promoting Interoperability performance category. The Promoting Interoperability performance category for the 2018 performance period is weighted at 30 percent for the Medicare Shared Savings Program and the Next Generation ACO model MIPS APMs. For all other MIPS APMs this performance category is weighted at 75 percent for the 2018 performance period. MIPS APM Fact Sheet: Provides an overview of a specific type of APM, called a "MIPS APM," and the special APM scoring standard used for those in MIPS APMs. What is the estimated size of MIPS adjustments? CMS estimates that approximately 676,722 eligible clinicians would be required to participate in MIPS in the 2017 MIPS performance period. Under the proposed rule, the payment adjustment for the 2019 payment year would range from - 4% to +4X% where X is an adjustment factor to allow the MIPS program to stay budget neutral. According to CMS, MIPS eligible clinicians would receive approximately $199 million in positive MIPS payment adjustments, including up to an additional $500 million for those with exceptional performance (eligible clinicians whose final score is 70 points or higher). CMS also estimates that 5.3% of the providers eligible for MIPS in 2017 will get a penalty. The average MIPS payment amount would be 0.94%. CMS estimates these numbers based on projecting past PQRS participation, past PQRS performance scores and past EHR Meaningful Use participation into the 2017 MIPS rules. Based on the CMS numbers, the penalty for not reporting MIPS for a clinician with an average of $116,000.00 in Medicare Part B income, will be $4,640 (4% negative payment adjustment). We estimate that the average payment for a clinician with a MIPS score between 3 and 100 will be $1,090 (0.94% positive payment adjustment). 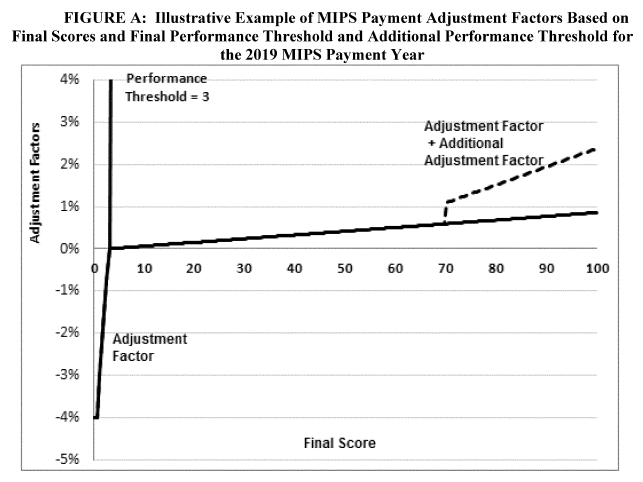 As shown in the graph above, the largest payments will apply to clinicians with MIP scores above 70. The reward for a perfect MIPS score of 100 points could be around 2.4% percent ($3,400 for a clinician with an average $116,000 of Medicare income). Can a MIPS quality measure without any Medicare patients in the denominator (e.g. eligibility criteria for measure)? For Registry, EHR, and QCDR providers must have a minimum of one eligible Medicare Part B Patient (regardless of how many Measures you Report) in order to utilize that Reporting Option. There should be one Medicare patient in the denominator of at least one measure (out of the required six). The Medicare patient does not have to be in the numerator (e.g. met the measure). Example: If one reports 6 measures via EHR, Registry, or QCDR -- one only needs "1" eligible Medicare patient total in order to meet the minimum requirements for the 2018 MIPS Program. Note: Providers should only choose and report on measures where they have at least one eligible Medicare case that qualifies for the measure. That patient/case does not have to be included in the report for that measure however (as long as you have at least 1 Medicare patient in 1 of your Quality measure reports). For PY 2018, data completeness criteria is to report on at least 60% of all eligible cases (meet the denominator criteria) for a measure regardless of payer. What is the maximum number of bonus points that can be earned within the Quality category? An additional Outcome measure (beyond the one required) is worth 2 bonus points. Measure #321 (CAHPS for MIPS survey) as an additional measure is also worth 2 bonus points because it is a patient experience measure. Any additional high priority measure that doesn't also fall into one of those two categories mentioned would be worth 1 bonus point. Everything mentioned in this paragraph regarding "additional" measures is subject to the cap of 10% of the total possible points for the Quality performance category. For most providers this will be a cap of 6 points. For the Quality category, to get bonus points for "additional" Outcome, patient experience (CAHPS for MIPS), or high priority measures, the measure does not have to fall into the top six/best six that are scored and used for the Quality performance category score, but to be eligible for "additional measure" bonus points, the measure must meet the 60% Data Completeness requirement (Reporting Rate), and meet the 20 case minimum volume threshold submitted, AND have a performance rate above 0 percent. Also, a Quality measure collected via end-to-end certified EHR technology (CEHRT) would also yield 1 bonus point for the Quality category, subject to the cap of 10% of the total possible points for the category. This means that overall, you can get up to 20% in bonus points in the Quality performance category from the two bonus categories above. CMS defines a patient-facing encounter as an instance in which a MIPS eligible clinician billed for services such as general office visits, outpatient visits, and procedure codes under the Medicare Physician Fee Schedule. What is the Patient-facing Encounters Codes List? A group provided that more than 75 percent of the clinicians billing under the group’s TIN meet the definition of a non-patient facing individual MIPS eligible clinician during the non-patient facing determination period. The utilization of Evaluation and Management Codes, Surgical and Procedural Codes, and Visit Codes accurately classifies MIPS eligible clinicians as non-patient facing and patient-facing. Given the flexibility in program requirements for non-patient facing clinicians, the encounter codes are critical for CMS to identify MIPS eligible clinicians. Where in the final rule does it indicate that MIPS reporting applies to both Medicare and non-Medicare patients? (1) At least 50 percent of the MIPS eligible clinician or group’s patients that meet the measure’s denominator criteria, regardless of payer for MIPS payment year 2019 (MIPS PY2017). (2) At least 60 percent of the MIPS eligible clinician or group’s patients that meet the measure’s denominator criteria, regardless of payer for MIPS payment year 2020 (MIPS PY2018). Response: We can appreciate the concerns raised by the commenter. We are continuing to use a 50 percent data completeness threshold similar to what was used under PQRS. We do note however that under MIPS the data completeness threshold applies for both Medicare and non-Medicare patients. We are finalizing our approach of including all-payer data for the QCDR, qualified registry, and EHR submission mechanisms because we believe this approach provides a more complete picture of each MIPS eligible clinician’s scope of practice and provides more access to data about specialties and subspecialties not currently captured in PQRS. What is a reporting rate? What is a performance rate? The reporting rate is the percentage of times that you answered all of the questions related to a particular measure. For individual measures, your reporting rate must be at least 60% meaning you reported the quality measure on at least 60% of those who were eligible. If you create more than 60% of your eligible cases for a measure, you must provider the "answers/numerator option" for at least 60% of the records entered. If you do not meet this threshold, the software will alert you. The performance rate is the percentage of times you met the measure (answered "done" or "performed") compared to the number of eligible patients entered for the measure. Numerator (# of times measure is met)/Denominator (number of eligible case for the measure). Note that answering with an exclusion option (if applicable) will take the eligible case out of the Denominator prior to final calculation of the performance rate. This will still count towards your reporting rate however. Performance rates of 100% are a perfect score. There are measures (i.e. Measure 1 Hemoglobin A1c) where a lower calculated performance rate is better. These are called inverse measures and a performance rate of 0% would be a perfect score. How do I choose which MIPS Quality measures to report? The measures you select should reflect your patient population, specialty and practice. You can also access our MIPS planning tool within our software by logging into your account and clicking on MIPS Measures Plans at the top of your dashboard. This interactive tool will allow you to search for Quality measures by specialty, determine which measures are outcome or high priority and also view the earning potential based on performance for each measure. This planning tool will also allow you to select measures for the PI (formerly ACI) and IA components for planning purposes. Is MIPS reported using my Individual NPI or Group NPI? Your individual NPI is used to report MIPS. The 24J field on your claims should contain the individual NPI. The TIN in field 25 and the individual NPI listed in 24J should always be used to report MIPS. If you look at your claim forms you will see that there are two different spots for NPIs. The 33a field is where the Group NPI is listed. Please do not report MIPS using the Group NPI. Are non-Medicare patients reported in MIPS Quality measures? For the Quality component of MIPS, each individual measure is reported on at least 60% of the clinician or group's eligible Medicare and non-Medicare patients. When reporting Quality measures how many records do I include? When reporting a MIPS Quality measure, a provider must report on at least 60% of all Medicare and non-Medicare patients who meet the eligibility criteria for that measure. In order to achieve more than just the base points for a measure (3 points for practices with 15 or fewer providers or 1 point for practices with 15+), only measure reports containing at least 20 patients/records in the denominator will be scored (compared against national benchmarks) for possible additional points. I’ve read that I must enter 60% of my eligible cases for each measure. Is this true? Yes. Each Quality measure is reported on at least 60% of all eligible cases - Medicare and non-Medicare - for the calendar year. Measures that are reported with less than 20 cases will earn 1 point (3 points for small practices with 15 or less providers under the TIN) and will not be scored against national benchmarks. Can I submit MIPS via claims and also via a registry? Yes, a provider can submit data via another submission method but CMS will make their payment adjustment based on the most complete set of data received from each source. The different methods cannot be combined to create 1 report. Is MIPS applicable to non- Medicare insurance? MIPS reporting of individual measures applies to all patients. Eligibility for a measure is based on CMS documentation (denominator criteria). Can I report MIPS as an individual or as a group via MDinteractive? A practice can report as individuals or as a group via MDinteractive. Group reporting is available to practices of 2 or more providers operating under a single TIN. If at least one provider in the group has eligible patient visits to report, every member of the group will avoid the MIPS penalty. When reporting as a group, each Quality measure is reported on at least 60% of eligible cases across the TIN. MIPS ineligible clinicians (due to falling below the low volume threshold for example) are included when calculating how many cases to report for a measure. The QPP participation site will provide guidance on which providers are included when reporting as a group. There is no CMS registration for group reporting in 2017. We ask that you contact us via e-mail (support@mdinteractive.com) if you will be submitting as a group. What is the CAHPS for MIPS survey? The CAHPS for MIPS survey is optional for all groups of 2 or more eligible clinicians, but MIPS provides several incentives for groups to participate. The CAHPS for MIPS survey counts as one measure toward the MIPS quality performance category, as a patient experience measure, and fulfills the requirement to report at least one high priority measure in the absence of an applicable outcome measure. Groups must report at least 5 additional quality measures using another data submission method. The CAHPS for MIPS survey is also included in the improvement activities performance category as a high-weighted activity. In order for groups to elect participation in the 2018 CAHPS for MIPS survey, they must register by June 30, 2018. Registration must be completed online through the MIPS Registration System. During registration, groups must indicate if they are selecting the CMS Web Interface reporting mechanism as well as elect to administer the CAHPS for MIPS survey. For additional information on registration and requirements please refer to qpp.cms.gov. How is the Composite Performance Score (CPS) for MIPS calculated? Quality - 50% of total score - 50 points max for most providers. Performance plus bonus points are added and divided by 10x the number of scored measures (maximum = 60 points for most providers). Base score of 50% - 12.5 points is achieved by reporting at least one use case for each available base measure. Base measures total either 4 or 5 depending on the edition of EHR (2014 or 2015). Base score measures must be completed in order to earn performance or bonus points. Note: Points max out at 100 (even though there is the potential to earn more). 100+ = 25 points max. IA - 15% of total score or 15 points max. Provider reportis 40 points worth of measures (i.e. 4 medium weighted activities or 2 high weighted) to earn 15 points for IA. For more detailed information about how the CPS is calculated, please visit our Overview Page under the MIPS Reporting heading on our website. Who is required to participate in MIPS? *Physician means doctor of medicine, doctor of osteopathy (including osteopathic practitioner), doctor of dental surgery, doctor of dental medicine, doctor of podiatric medicine, or doctor of optometry, and, with respect to certain specified treatment, a doctor of chiropractic legally authorized to practice by a State in which he/she performs this function. Who is excluded from MIPS? What is the low volume threshold? Are non-patient facing providers required to report the Promoting Interoperability (formerly ACI) category of MIPS? Non-patient facing MIPS eligible clinicians will have their PI category automatically reweighted to zero by CMS. "We proposed to automatically reweight the advancing care information performance category to zero for a MIPS eligible clinician who is classified as a non-patient facing MIPS eligible clinician (based on the number of patient-facing encounters billed during a performance period) without requiring an application to be submitted by the MIPS eligible clinician." "Under the MIPS, we proposed to automatically reweight the advancing care information performance category to zero for any hospital-based MIPS eligible clinicians and/or nonpatient facing MIPS eligible clinicians who may not have sufficient measures applicable and available to them." Is a hospital based provider required to report the PI (formerly ACI) category of MIPS? Hospital-based MIPS eligible clinicians will have the PI category automatically weighted to zero by CMS (the 25 points will be reweighted to Quality making it 75% of the total MIPS score). Hospital-based ECs are those who provide 75 percent or more covered professional services in the inpatient hospital (POS 21), on campus outpatient hospital (POS 22) or emergency room (POS 23) settings. "For these reasons, we proposed to rely on section 1848(q)(5)(F) of the Act to assign a weight of zero to the advancing care information performance category for hospital-based MIPS eligible clinicians." "With consideration of the comments and data we have reviewed, we are reducing the percentage of covered professional services furnished in certain sites of service to determine hospital-based MIPS eligible clinicians from 90 percent to 75 percent. The data analyzed supports the comments we received while still allowing MIPS eligible clinicians with 25 percent or more of their services in a settings outside of inpatient hospital, on-campus outpatient hospital (as referenced below) or emergency room settings to participate and earn points in the advancing care information performance category." "We agree with commenters that there are MIPS eligible clinicians who bill using place of service codes other than POS 21 and POS 23 but who predominantly furnish covered professional services in a hospital setting and have no control over EHR technology. We believe these clinicians should be considered hospital-based for purposes of MIPS, and therefore, we are expanding our hospital-based definition to include POS 22, on-campus outpatient hospital." Will the Medicaid EHR Incentive Program and MIPS stay separate? "Comment: Some commenters requested that CMS clarify the proposal to eliminate the need to track and report duplicative quality measures by modifying its proposal to require that if quality is reported in a manner acceptable under MIPS or an APM, it would not need to be reported under the Medicaid EHR Incentive Program. The commenters were concerned the programs could potentially cause the same conflict CMS specifically noted MIPS and APMs were intended to correct. CMS Response: We thank the commenters and have worked to eliminate duplicative measures between MIPS and other programs where possible. We intend to continue to align MIPS and the Medicaid EHR Incentive Program to the greatest extent possible. As we have noted in section II.E.5.g. of this final rule with comment period, the requirements for the Medicaid EHR Incentive Program for EPs were not impacted by the MACRA. There is a requirement to submit CQMs to the state as part of a successful attestation for the Medicaid EHR Incentive Program. While the MIPS objectives for the advancing care information (now called Promoting Interoperabilty) performance category are aligned to some extent with the Stage 3 objectives in the Medicaid EHR Incentive Program, they are two distinct programs, and reporting will stay separate. Will more eligible clinicians types be subject to the requirements of EHR reporting under MIPS? "In addition, we recognize that under MIPS, there will be more eligible clinicians subject to the requirements of EHR reporting than were previously eligible under the Medicare and/or Medicaid EHR Incentive Program, including hospital-based MIPS eligible clinicians, nurse practitioners, physician assistants, clinical nurse specialists, and certified registered nurse anesthetists. Since many of these non-physician clinicians are not eligible to participate in the Medicare and/or Medicaid EHR Incentive Program, we have little evidence as to whether there are sufficient measures applicable and available to these types of MIPS eligible clinicians under our proposals for the advancing care information performance category. As a result, we have provided additional flexibilities to mitigate negative adjustments for the first performance year (CY 2017) in order to allow hospital-based MIPS eligible clinicians, nurse practitioners, physician assistants, clinical nurse specialists, certified registered nurse anesthetists, and other MIPS eligible clinicians to familiarize themselves with the MIPS program. Section II.E.5.g. (8) of this final rule with comment period describes our final policies regarding the re-weighting of the advancing care information performance category within the final score, in which we would assign a weight of zero when there are not sufficient measures applicable and available." Can the PI and IA categories be attested to via MDinteractive? Yes! You can also use MDinteractive to attest to the Promoting Interoperability (PI) and Improvement Activities (IA) categories of MIPS. Promoting Interoperability requires that you have CEHRT technology. You do not need to have an EHR to attest to Improvement Activities. What are the advantages of reporting MIPS via Registry vs. Claims? Reliabilty: Registries are more reliable. Per CMS, "18 percent of those who attempted to participate via claims were unable to submit any measures satisfactorily, compared to 1 percent for those using a registry". Ability to Edit Data Before Submission: With claims based reporting once you file a claim with quality codes on it, you can't correct it or make changes on it. Avoids Extra Work Coding Claims: Each quality measure may involve 1 or 2 G-codes. Depending on the quality measures chosen, you may need to send a claim with 9 extra lines to do the reporting. Maximize Your Score: If you change you mind during the year and you would like to report another measure(s) where you can reach higher performance, you can't do it with claims reporting. CMS expects every measure reported to reach a 60% reporting rate or else the submission will fail. With the registry, you can choose to report only the measures that will maximize your quality scores. Ability to Track Performance: Tracking performance with claims reporting is very difficult. Once some clinical data is entered into the registry, you can see your performance in a dashboard anytime you login. Low Cost for Reporting: The registry fee is lower than the potential loss of revenue if claims reporting fails. For example, according to the last available PQRS experience report, only 114,513 providers reported PQRS successfully out of 283,837 providers using the claims reporting method. The claims success rate was 40%. Better Opportunity for Upward Adjustments: Per CMS, "among individual participants, incentive eligibility rates were 93 percent among those using registry measures groups, 59 percent for registry individual measures, 57 percent for EHR, 43 percent for QCDR, and 40 percent among eligible professionals participating via claims." failure to submit Quality Data Codes for at least 50 percent of eligible instances". Customer Support Service: Working with a registry doesn't just mean working with the software. We have a MIPS educated and dedicated staff that will help you avoid a potential penalty and achieve the highest earning potential based on your practice goals. What are the advantages of using a registry such as MDinteractive? CMS has demonstrated that providers using registries were significantly more likely to avoid penalties (and earn incentive in previous years) when compared to claims-based reporting. What MIPS Quality measures can I report using MDinteractive? MDinteractive supports all 2018 MIPS Quality registry-based and EHR-only individual measures. Note: MDinteractive can also be used to attest to the PI and IA categories of MIPS (all available measures and activities). What option should a provider choose on the "Reporting Clinical Quality Measures" EHR MU attestation question? When doing the EHR MU Attestation and reporting PQRS using MDinteractive please choose option 2 (I will submit my clinical quality measure data right now through attestation) because a provider using MDinteractive Qualified PQRS registry or the MDinteractive Specialized registry will NOT satisfy the eCQM EHR MU reporting requirement. Was the Medicaid EHR Incentive Program for EPs impacted by the new MACRA rules? "We noted that the Medicaid EHR Incentive Program for EPs was not impacted by the MACRA and the requirement under section 1848(q) of the Act to establish the MIPS program. We did not propose any changes to the objectives and measures previously established in rulemaking for the Medicaid EHR Incentive Program, and thus, EPs participating in that program must continue to report on the objectives and measures under the guidelines and regulations of that program. Accordingly, reporting on the measures specified for the advancing care information performance category under MIPS cannot be used as a demonstration of meaningful use for the Medicaid EHR Incentive Programs. Similarly, a demonstration of meaningful use in the Medicaid EHR Incentive Programs cannot be used for purposes of reporting under MIPS. Therefore, MIPS eligible clinicians who are also participating in the Medicaid EHR Incentive Programs must report their data for the advancing care information performance category through the submission methods established for MIPS in order to earn a score for the advancing care information performance category under MIPS and must separately demonstrate meaningful use in their state’s Medicaid EHR Incentive Program in order to earn a Medicaid incentive payment. The Medicaid EHR Incentive Program continues through payment year 2021, with 2016 being the final year an EP can begin receiving incentive payments (§ 495.310(a)(1)(iii)). Comment: Many commenters stated the reporting burden imposed on MIPS eligible clinicians who also participate in the Medicaid EHR Incentive Programs, would have to report separately to achieve points in the advancing care information performance category, and to receive an incentive payment in the Medicaid EHR Incentive Programs. Some commenters urged CMS to align reporting requirements and submission methods across both programs to eliminate duplication in reporting effort. Some commenters requested that CMS eliminate the need to report duplicative quality measures by modifying its proposal to require that if quality is reported in a manner acceptable under MIPS or an APM, then it would not need to be reported under the Medicaid EHR Incentive Program. Other commenters expressed concern that varying reporting requirements for MIPS eligible clinicians, for hospitals and Medicaid EPs who participate in the EHR Incentive Programs will bring hardship to clinician staff, as well as EHR vendors. Response: We understand that reporting burden is a concern to MIPS eligible clinicians and CMS remains committed to exploring opportunities for alignment when possible. However, MIPS and the Medicare and Medicaid EHR Incentive Program are two separate programs with distinct requirements. The reporting requirements and scoring methods of the Medicaid EHR Incentive Program and those finalized for the advancing care information performance category in the MIPS program differ significantly. For example, in the Medicaid EHR Incentive Programs, EPs must report on all objectives and meet measure thresholds finalized in the 2015 EHR Incentive Programs final rule. In the advancing care information performance category, MIPS eligible clinicians must report on objectives and measures, but are not required to meet measure thresholds to be considered a meaningful EHR user. We remind commenters that while MIPS eligible clinicians would be required to meet the requirements of the advancing care information performance category to earn points toward their MIPS final score, there is no longer a requirement that EPs demonstrate meaningful use under the Medicaid EHR incentive program as a way to avoid the Medicare EHR payment adjustments. However, MIPS eligible clinicians who meet the Medicaid EHR Incentive Program eligibility requirements are encouraged to additionally participate in the Medicaid EHR Incentive Program to be eligible for Medicaid incentive payments through program year 2021. Comment: A few commenters proposed that MIPS eligible clinicians who are participating in the Medicaid EHR Incentive Program be exempted from reporting to MIPS until after the completion of their final EHR performance period. Others proposed allowing clinicians to choose either to report in the Medicaid EHR Incentive Program or the advancing care information performance category of MIPS. One commenter suggested awarding MIPS eligible clinicians 30 points toward the advancing care information performance category score if they successfully attest to meaningful use in the Medicaid EHR Incentive Program. Response: As previously mentioned, objective and measure requirements of the Medicaid EHR Incentive Program and those finalized for the advancing care information performance category in the MIPS program vary too greatly to enable one to serve as proxy for another. We are finalizing our Medicaid policy as proposed." If we already report Meaningful Use, do we also have to report PQRS? Yes. PQRS must also be reported in order to avoid the non-reporting penalty. PQRS and Meaningful Use are separate CMS programs. Beginning in 2017, with the introduction of MIPS, Meaningful Use will be replaced by a component called Advancing Care Information or ACI. Reporting ACI will have the potential of earning the provider/practice up to 25 points in their overall composite score. ACI can be attested to via MDinteractive.